Of late, the glam trend of 1960s home entertaining, the humble drinks trolley, has made a major comeback and with good reason. Who doesn’t like the sound of bringing back a cocktail hour at their place, serving up fruity and delicious beverages while socialising with guests and housemates? This retro trend has been welcomed back with open arms by Aussies, as bar carts are wheeled out with pride at dinner and cocktail parties at homes all over the country. Here are the five essentials you need to create the perfect portable bar trolley. First things first, you’ll need to get your hands on a trolley to set up as your cocktail station. From brassy industrial looks, kitsch retro timber models to sleek contemporary versions, there’s sure to be a material and style of trolley to suit your taste and decor. Before buying a cart check out its sturdiness, as you don’t want any spills while mixing drinks or anything to tumble off as you manoeuvre it from one room to another. Also, look out for features that make staying organised easier, such as the inbuilt wine and glass racks below. If you don’t have space for a trolley there’s no reason you can’t convert an existing piece of furniture, such as a tray table, side board or bookshelf, into a functional and attractive cocktail station. One of the best investments you can make for your bar cart, is a quality steel cocktail set. Most basic sets will include measuring cups, ice tongs, a muddler, a bar spoon, pourers, a strainer and of course a cocktail shaker. There are all kinds of fabulous cocktail kits on the market. We love this chic copper cocktail kit. Other tools of the trade to consider including are a shiny ice bucket, a bottle opener, a soda syphon, a citrus press, a paring knife and a grater, for those more complicated recipes. Don’t feel as though you must stock your bar cart with every spirit under the sun. Choose the select few liquors you prefer that are key ingredients in your favourite cocktails. A few good basic spirits that are used in a lot of different cocktails to get your bar started are gin, rum, tequila, whiskey and vodka. Quality liquor can be very costly so if you’re unsure whether you like something buy the tiny travel sized bottles to start off and experiment with. You’ll soon get a taste for the recipes you like and don’t like mixing. Once you’ve whipped up your favourite cocktail you’ll need something fancy to serve it in. So, you’ll need the appropriate glassware on hand for all your favourite and signature beverages. Check out copper mugs, champagne flutes, martini glasses, old school decanters and crystal tumblers to line up at the ready on your cart. Opt for a set of vintage style champagne coups for a glam nod to roaring 30s style. 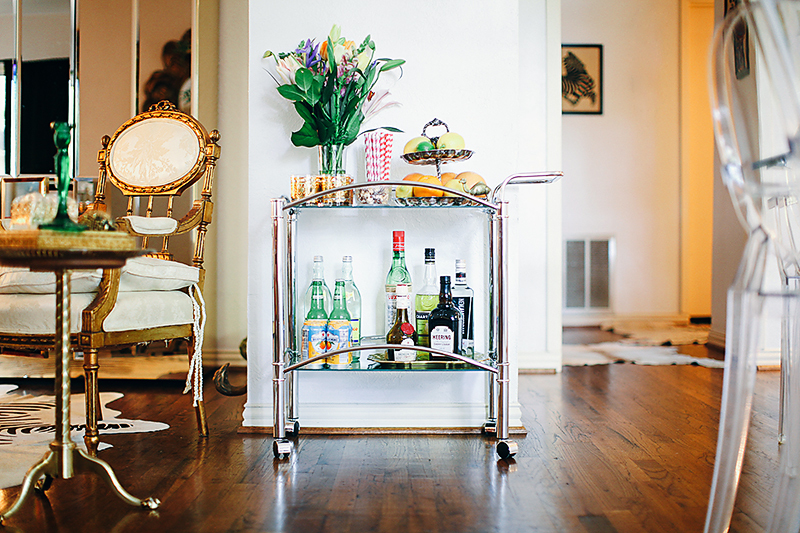 Half the fun of a bar cart is styling it with sparkly and shiny knick-knacks to up the glamour of your space. Adorn your bar cart with stirrers, bottle stoppers, cloth napkins, coasters, a marble chopping board, pretty paper straws and a vase of fresh flowers or citrus fruits. For an elegant touch, present your liquor bottles and glassware on metallic or mirrored trays. They also come in handy when you need to serve a large group your tasty creations. Don’t forget to keep a couple of cocktail recipe books handy as points of reference and for guests to peruse. Hopefully this five-step guide to setting up a bar cart makes your next event that little bit more festive and your living room that little bit more sophisticated. For more retro decor ideas check out these 70s home décor trends making a comeback, 10 reasons to love wallpaper and the dirt on terrariums.